Join us for our Grand Opening of the May Maker Market that coincides with First Fridays in Leesburg! Be the first to peruse all the beautiful products from local brands and makers while sipping wine from Walsh Family Wine and slurping popsicles from Frozen Stuff on a Stick. The May Maker Market is a limited time pop up shop, open every Saturday throughout May, that will feature a carefully curated selection of local luxuries for self-care, enhancing the home, and gifting to others. Join us for our very first weekend open! Be among the first to peruse all the beautiful products from local brands and makers while slurping popsicles from Frozen Stuff on a Stick. Join us every Saturday in May for the “May Maker Market”! This limited time pop up shop will feature a carefully curated selection of local luxuries for self-care, enhancing the home, and gifting to others. 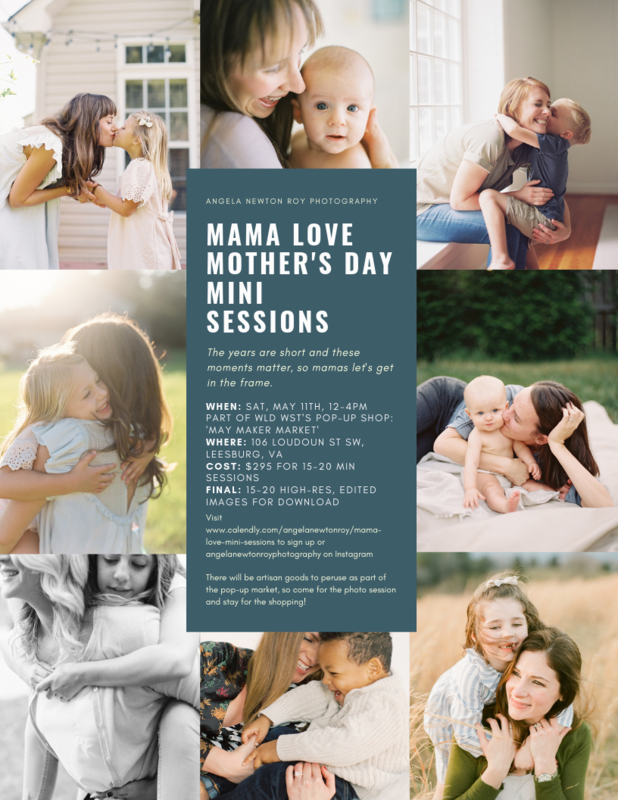 Angela Newton Roy is an incredibly talented fine art photographer and we are absolutely thrilled to host her Mama Love Mini Sessions here are the wldwst studio during our May Maker Market pop-up shop! Angela has photographed so many events both personal and professional for us over the years (including all the main images on our site!) and we cannot sing her praises enough. Her ability to put her subjects at ease and make everyone feel their most authentic and beautiful is a true gift. She very rarely offers mini portrait sessions like these and there are just a few slots available on May 11 so be sure to sign up early! Bring your babies young or old and celebrate Mother’s Day at the market! Click here to reserve your time slot. May Maker Market | Final Day to Shop!